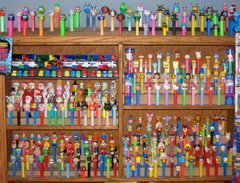 post below ... rather than do a whole new "PEZ WATCH" post. At least for the next few months. The Valentine Faerie brought the first PEZ of 2009 to 336. One for each of the current residents - the new CHERUB the BLACK BEAR Furry Friend and HOT PINK CRYSTAL HEART The black bear Valentine Furry Friend joins his pals from 2007.